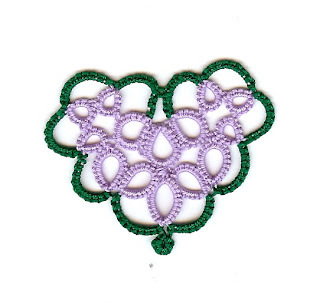 I am just trying to keep up with Tatting Chic with finishing projects. Two are hankies, the blue one wasn't very old, but I had finished it last week just didn't want to sew it on. The green one I worked on last summer when I went to Alaska so you know how old that was. Even before I learned on this wonderful community and learned about picot gauges. It would have been much easier to attached had my picots been all the same. As you can see the blue edge is a hen and chick pattern. 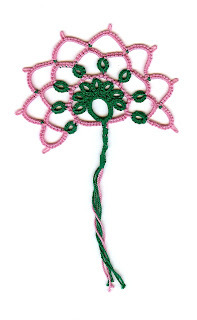 The green one is the simplified version of Skipping Ropes from Mary Konior's Tatting with Visual Patterns. My plan was to have it done for my daughters wedding, but alas I didn't make it as she was married in July. Oh well it is done now. At least that is two projects completed. It took me all day to add the edgings to the hankies. The blue one was a purchased hanky and the green is one I actually cut out and hemmed. Last summer when I was looking for hankies I couldn't find any so I purchased a yard of linen fabric and cut out my own. At least that way I can adjust the size and make a bigger hanky if needed. I didn't know about Handy Hands or the Be-Stitched store then. Last night before I thought about UFP's I worked up this little fan. It is number 4 for the 25 Motif Challenge. I found it on the Be-Stitched page and couldn't resist. It is a Contest Winner and was created by Connie Strobel. It was fun to do but I did have a false start and had to start it a second time. All in all I am happy with the way it turned out. Now if I can find something to do with it. Maybe put it on the front of a card??? And then because I couldn't go to sleep I did the quick Li'l Heart by Birgit Phelps. 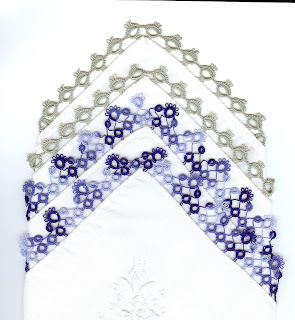 It was quick and easy and will now become number 5 for the 25 Motif Challenge. Now I can start something new or maybe I better make pj's from my granddaughter who requested a new pair at Christmas time. LOL! You are FAR ahead of me on finishing up those UFO's! If your oldest UFO is only from last summer you are way far ahead, LOL! My problem is I keep going on to these new projects, which I do finish! It's just these old ones that I have a hard time finishing, for more than one reason, LOL!